This guest post is written by Dr. Andreas Prokop from the University of Manchester. He is passionately engaged in Drosophila-related outreach activities and science communication and writes here about the importance of using fruit flies in the classroom and calls on other fruit fly researchers to help develop strategies to achieve this goal. Drosophila clearly is the animal in which biology is conceptually best understood. But how well do we sell this fact to the public and in schools? Certainly, Drosophila is far more than an animal substitute for Mendel’s peas, and the recent post by Bethany gives wonderful examples of what can be done with flies as modern and effective teaching tools in class rooms. The enormous power of bringing Drosophila into schools becomes unmistakably clear when talking to members of the public: those who experienced flies in schools, even decades ago, tend to respond with noticeably greater curiosity and interest to fly-related topics than those without such memories. Importantly, there are many biology specifications of the curriculum that can be explained extremely well using flies – and this can usually be spiced up with exciting, simple and cheap experiments that are likely to stick in pupils’ minds for the future. However, in this scenario, flies should not necessarily dominate but rather be used as teaching tools wherever they can help teachers to achieve a lesson’s learning objectives. Learning modern biology through flies, shoulder-to-shoulder with related human examples, clearly conveys the value of simple invertebrate model organisms without any further need to emphasise and explain. If we can establish flies in this way as modern teaching tools in schools, this will in the long term be more powerful than labour-intense Drosophila days at schools organised by scientists, and will have a chance to be applied on a far larger scale. In Manchester, we are experimenting with the above ideas very successfully. However, it has become clear that a key challenge is the creation of resources for teachers. Such resources will only work if they are concise, explained in simple terms and conceptually mature, so that they meet the needs of busy teachers in each and every aspect and help them gain quick understanding which they can then pass on to their students. To acquire the necessary expertise for this task, we have started to place PhD students for several weeks as active teacher assistants in schools, which allows them to experience school realities first, before generating adequate and tailor made resources. However, this is only one strategy and more effort is needed. It would therefore be great if other members of the fly community contributed, thus generating a wider choice of materials to meet the individual needs and personal tastes of a greater range of teachers. If you are interested in this kind of activity and are attending the American Drosophila Research Conference in 2015 in Chicago, please come to the Drosophila science communication workshop to discuss possible strategies. Clearly, long-term strategies are needed if we want to promote the wider understanding of invertebrate model organisms, thus also addressing the current downturn in Drosophila funding recently highlighted by Hugo and his colleagues. Tragically, this decline occurs in times where Drosophila research is perhaps more urgently needed than ever, when considering that Human Genetics and “omics” approaches bring up more questions than could possibly be answered without the fly. Starting in schools addresses this problem at its roots and lays important foundations for the future. But there is also personal benefit from these activities: engaging with the public in any way (and this clearly includes engagement at schools!) helps to develop the right arguments that work with members of the public – hence, naturally, also with members on grant panels! In my experience, it forces one to think about the essentials of one’s science leading to new ideas and thoughts, thus becoming a win-win activity that pays off in two directions. I totally agree with you that Drosophila should be used in schools to understand not only basic biological developmental events but also diseases that related to human so that students would be exposed to the concept of evolution and how it applies to human. From my experience through out my undergrad school, I had to take three genetic courses that focused mainly on human genetics which made my conception of genetic limited to human. When I applied to a grad school here in the US, I didn’t have any background about flies as a model organism which made me think about the huge gap in our education system. However, my goal when I get my master’s degree, hopefully my PhD also, is to change the concept that people still don’t understand or valuate about Drosophila in Biology and I hope teachers in schools also see the effectiveness of the model organisms in elucidating basic biological events. Thanks for your kind words in support of our initiative. There are many important arguments to be said about teaching fly stuff in schools and Universities. They are fantastic tools to convey the fundamental principles of genetics and many aspects of biology. However, here in the UK we experience that Uni students often consider lectures containing Drosophila as irrelevant and we need to invest time to first convince them of the concept of invertebrate model organisms in research first, before we can turn to scientific contents. We can hardly blame them, when seeing the school curriculum they were taught under, and your experiences in the US seem to be similar. Our vision is that students come better prepared to Uni, already thinking that working with model organisms is cool because it allows you to dig so much deeper and work so much faster than in mammalian systems – always considering of course the topic of research! For example, in flies we can very efficiently study the molecular and cellular mechanisms of neuronal decay in Alzheimer’s (i.e. the fundamental biology of this disease), but certainly not the phenomenon of personality loss. There are no bones in flies, but we can study fundamental mechanisms of stem cell niches which might give us new concepts relevant also for research into bone formation. Clearly there are limitations that need to be openly admitted to not discredit the enormous advantages that can be gained. As to human genetics, there is no doubt that it is by far the most refined genetics we have, and of course the means by which it is studied these days have moved on from classical genetic approaches which are no longer required to understand the genetics of disease. You may be aware of the article by Rosemary Redfield (http://journals.plos.org/plosbiology/article?id=10.1371/journal.pbio.1001356) where she argues that modern omics technologies have generated a need to change the ways in which we teach genetics to students on modern Uni courses. This is true, but it is also true that an understanding of classical genetics is still pivotal (see box 4 in her article), because the inheritance of genes, their mutations and modifiers remains a fact also in modern times. Furthermore, we must not forget that classical genetics remains a key strategy in all genetic model organisms from worms to mice. So there is a relevant training demand, and we need to meet it with great efficiency, so that we leave space on courses for modern genetics strategies. To achieve this, we are experimenting here in Manchester with methods to teach Drosophila on Uni courses (http://figshare.com/articles/2nd_year_Genetics_practical/156395). We do this with great success and clearly find that we can achieve good understanding of classical genetics in relatively short time, simultaneously conveying the enormous advantages and importance of simple model organisms in contemporary research. Adding to the above article, I would like to point out that things have moved on since then. We have successfully completed the first round of PhD student placements in schools which has been a great success. It is a sobering experience to see school realities. At the same time, it inspires to think about strategies to tackle some of the key problems, such as the limited time that teachers have to gain conceptual understanding of the topics they teach, or the little lee way they have to develop new approaches. This offers great opportunities for scientists to collaborate with schools! To demonstrate one feasible way forward, we have since uploaded two sample lessons on figshare (http://figshare.com/articles/Biology_lessons_for_schools_using_the_fruit_fly_Drosophila/1352064http://figshare.com/articles/Biology_lessons_for_schools_using_the_fruit_fly_Drosophila/1352064) and published the accompanying “droso4schools” web page (https://droso4schools.wordpress.com/). The droso4schools web site is the essential platform on which the sample lessons are advertised and explained, but it also serves two further purposes: (1) to provide support information for the two sample lessons – ideal for revision and homework tasks; (2) to provide lay information about Drosophila and its importance and uses, so that teachers feel more secure when teaching with fly and students can inform themselves beyond the lesson contents (ideal also to teach undergraduates at uni!). For example, the “Why fly?” tab explains the various reasons for Drosophila in ways that were not available to the community so far (comments welcome! 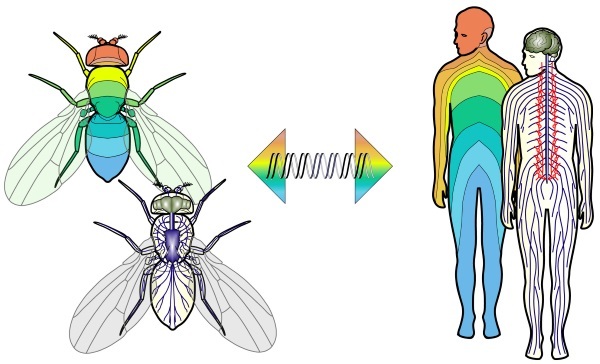 ), and the “organs” tab provides an overview over fly organs compared to their human homologues. Feel free to have a look and browse around! Furthermore, I would like to mention here that our second “Small fly, big impact” film has gone live (https://www.youtube.com/channel/UCRUW0eMYSbFsdGtBpNVmPjg), and you might be interested in a blog about Drosophila outreach strategies published recently (https://poppi62.wordpress.com/2015/05/12/fly-scicomm/).